Bread Street Kitchen (‘BSK’), a restaurant chain owned by celebrity chef Gordon Ramsay serving traditional British cuisine is approaching its 4th year in Singapore. His straight forward and confrontational personality plus the frequent use of profanity definitely makes a good TV show. 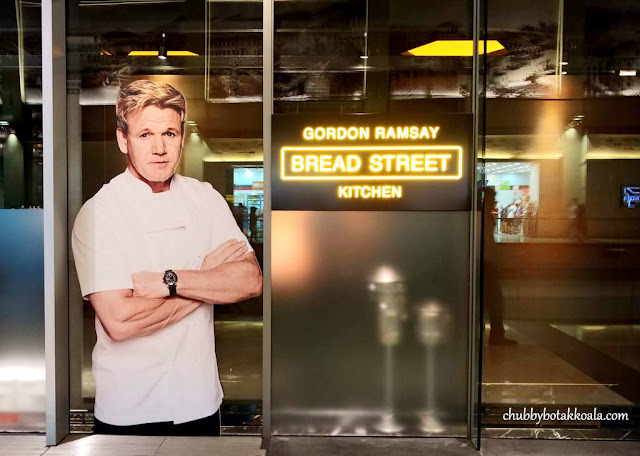 However, TV shows are created based on achievement in the F&B industry as many of his restaurants received worldwide accolades. BSK occupied 2 stories at The Shoppes at Marina Bay Sands. The restaurant opens for more than 3.5 years with a steady stream of customers. This is the first time I visited BSK to celebrate our friend’s birthday. 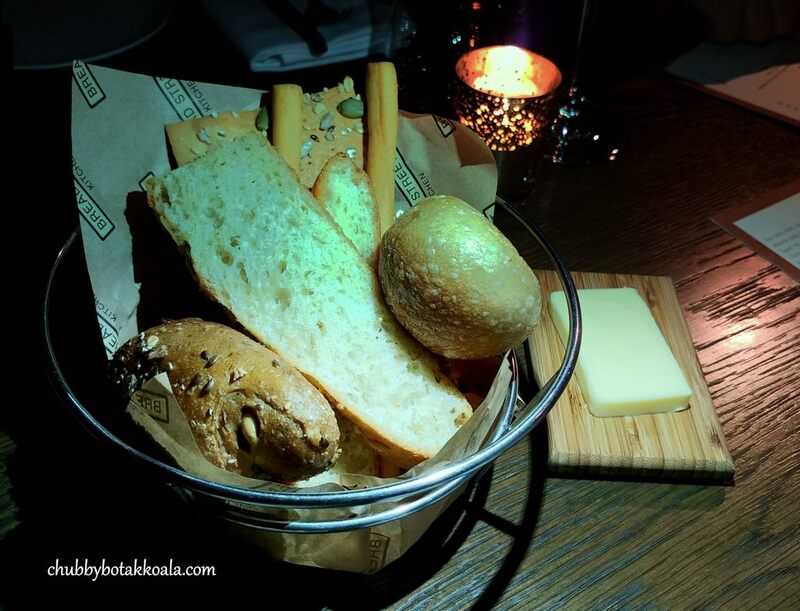 The bread basket is served while we are waiting for our starters. Combination of grissini, baguette, dinner roll and multigrain. The breads are delicious and go nicely with their butter. The service staff will gladly refill the bread if needed. 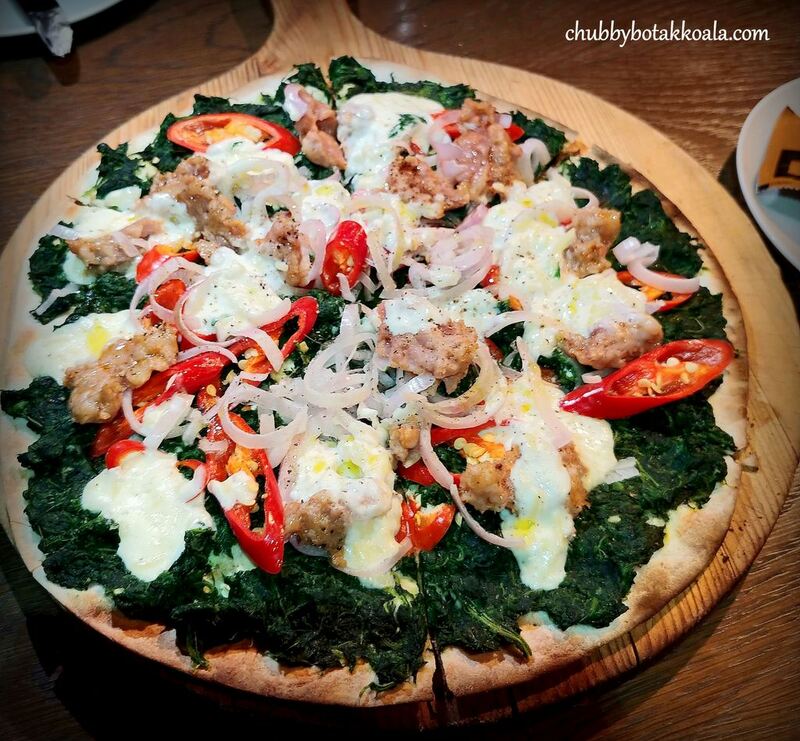 Starters include Flatbread, fennel and pork sausage, spinach, crème fraiche, red chilli, shallots ($28 – sharing portion). The huge sliced chilli in the middle definitely catches my attention when the dish is placed on the table. The base is crispy topped with a generous spread of vegetables. However, the pork sausage is scarce and the chilli kind of put me off from this dish. 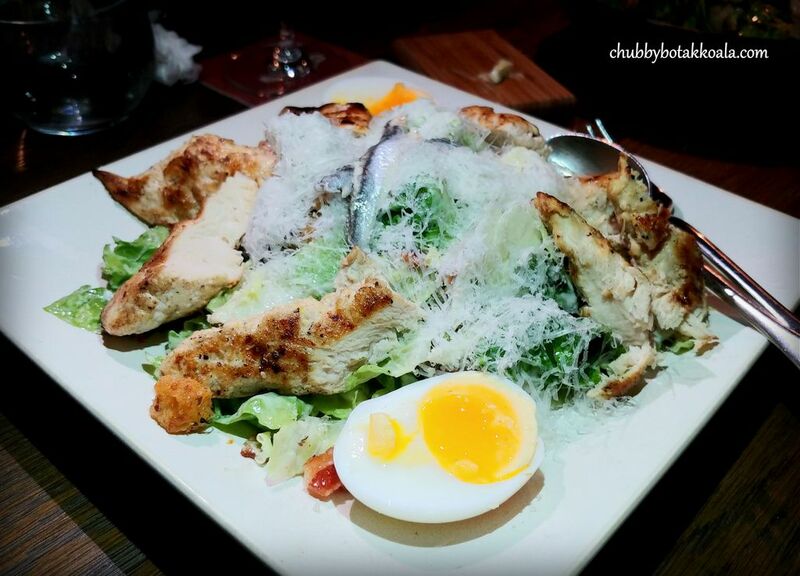 Grilled Chicken Caesar Salad, Pancetta, Anchovies, Soft Boiled Egg, Parmesan $28 (main size). Excellent mixed, you can taste the anchovies in the salad dressing. 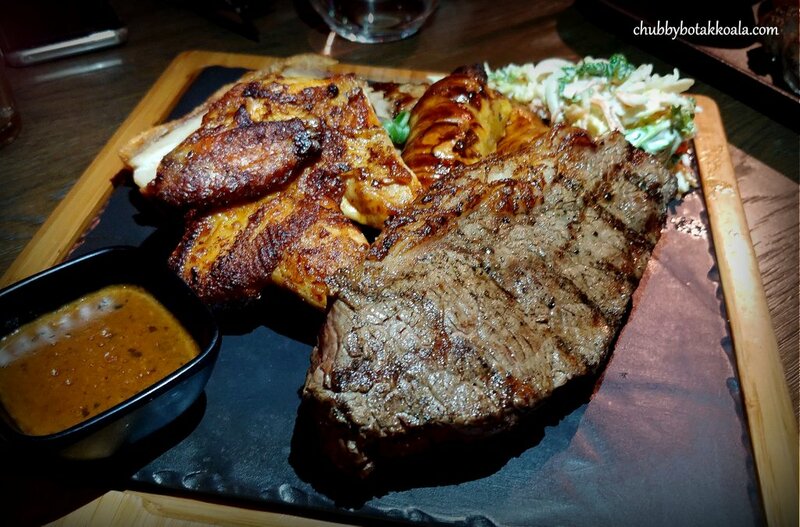 The grilled chicken is well seasoned and succulent, and the pancetta is definitely generous. Well-executed traditional dish. Watermelon, avocado, feta, rocket, pumpkin seeds, balsamic dressing ($26 – main size). 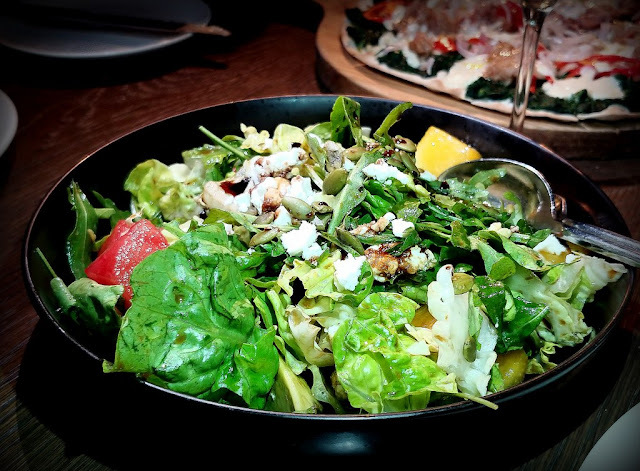 One of the salads that I will definitely order if I see it on the menu. The version here uses a combination of red and yellow watermelon, mixed with savoury feta cheese and bitter arugula leaves. The feta cheese helps to intensify the sweetness of the juicy watermelon. It sure wakes up your palate in the anticipation of the main meal. 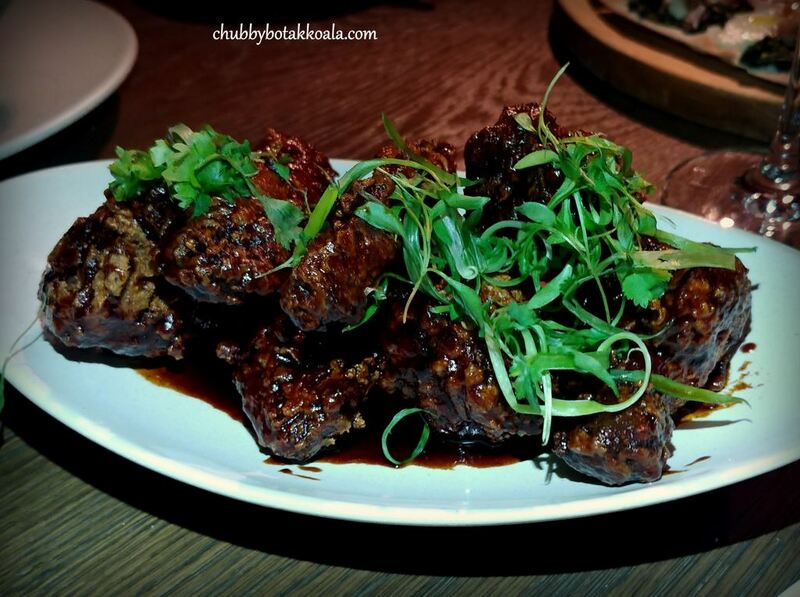 Tamarind spiced chicken wings, spring onions, coriander ($18). My first impression it looks like Marmite chicken. The wings are crispy, coated with “assam”. However, it lacks contrasting flavour, something sweet like honey will definitely help. I must say, the Marmite chicken in Chinese restaurant tasted better. From the grill, we ordered Irish Angus Rib-eye steak 320g 28 days aged grass fed ($70). 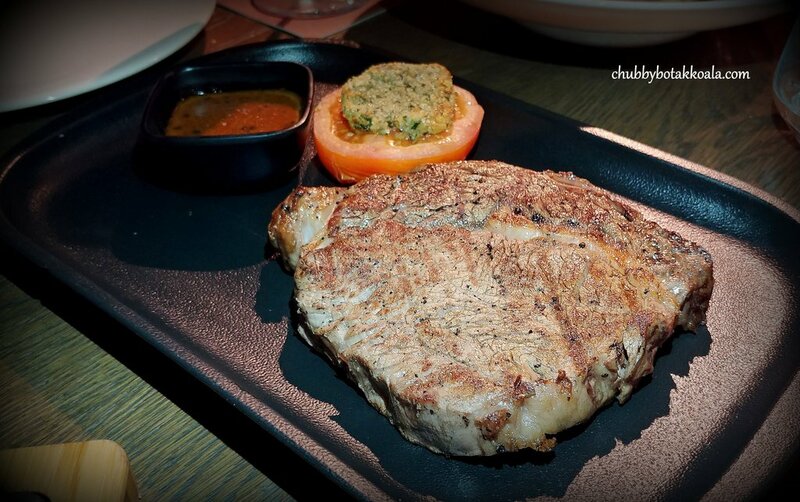 A solid rib-eye steak. Don’t expect those wagyu that melts in your mouth type. Instead, it is a tender, meaty steak and filled with beautiful beef flavour in each bite. 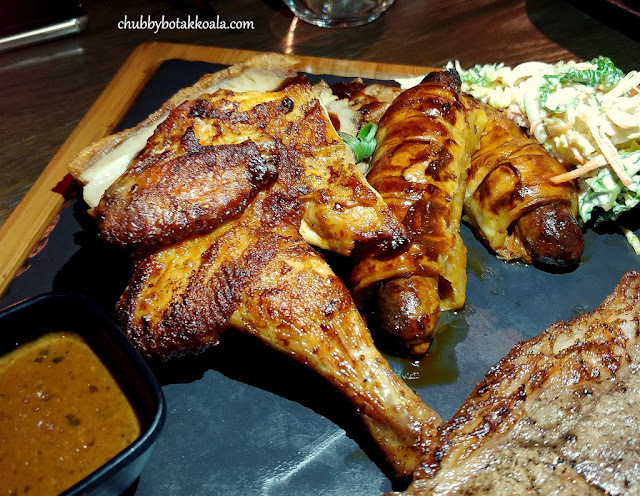 Butcher’s Board to share ($132) consist of sirloin steak, half baby chicken, Dingly Dell pork belly and lamb sausage. The sirloin is tender, meaty with the same taste profile as the Irish rib-eye. 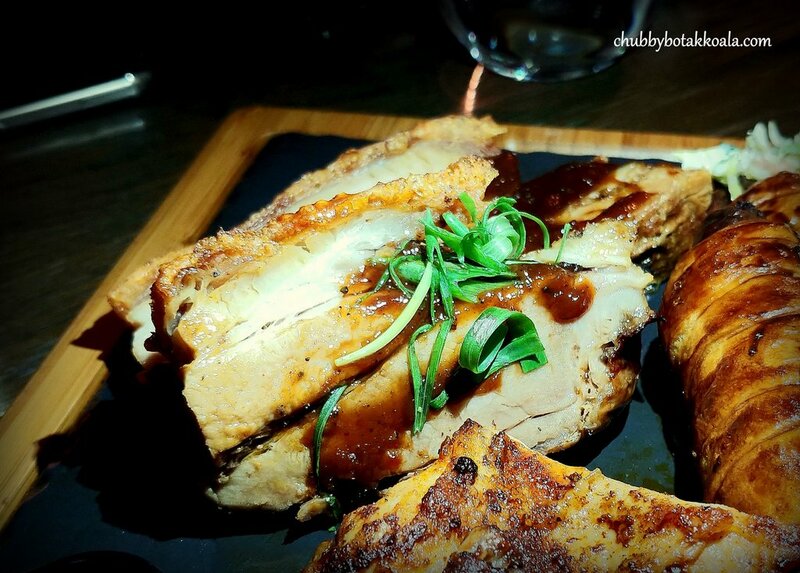 The half chicken is crispy, succulent and absent of excess fats. Meanwhile, the lamb sausages are wrapped with bread, looks like a hotdog bun. The sausages have a strong gamy taste in it and being balanced with generous rosemary seasoning. The slow roast Dingly dell pork belly has a light crispy texture; however, the meat is dry. I personally don’t like the BBQ sauce. I prefer to dip it in the other sauce, which has a combined taste of pepper sauce and brown sauce. 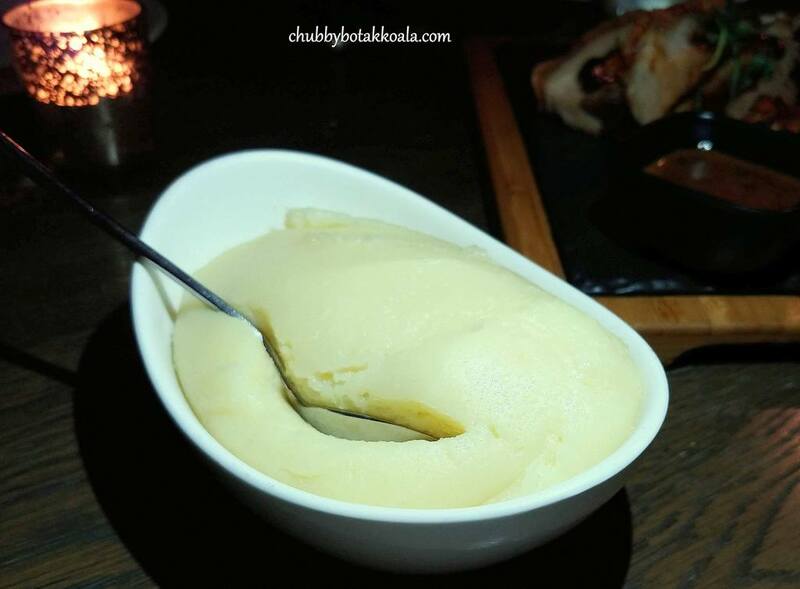 For the side, we ordered mash potatoes ($10). It is thick, dense followed with a creamy flavour, not the smooth velvety version. 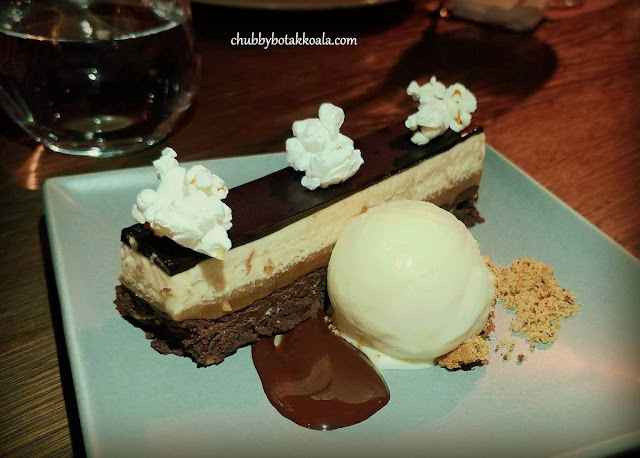 Desserts were BSK snickers, popcorn ice cream ($18). A luxury version of Snickers bar. Good combination of chocolate, caramel and milk. The popcorns and ice cream actually help to cuts the sweetness from the caramel. Of course, you cannot have a Snickers without the peanuts, which is served crushed here. 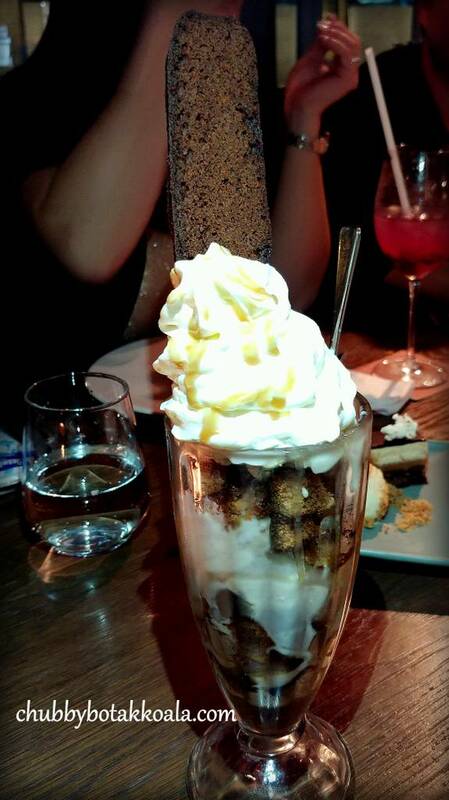 Sticky toffee sundae, banana ice cream, whipped cream, caramel sauce ($18). Delicious and rich toffee sundae. We don’t like banana ice cream so we ask for vanilla ice cream instead. The combination of toffee sponge, vanilla ice cream and caramel sauce is just delightful. Yum Yum. 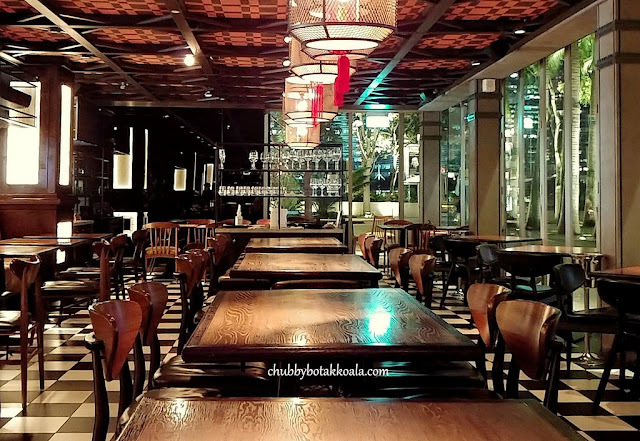 The atmosphere in the restaurant has a similar feel to a modern gastropub. The lighting is very dim, making it difficult to see the exact colour of your food. 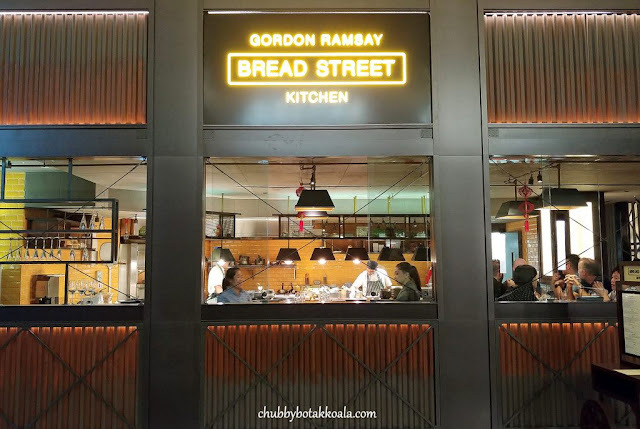 As one of the levels located parallel to one of the MBS walkways, we can see the view outside and the people outside can see what we dine inside the restaurant. Service is good and efficient. The service staff knowledgeable, however, it can be difficult to get their attention due to the lightings in the restaurant. Overall, not all the dishes here are in sync with my taste buds. The salads are awesome, traditional grills are good, but I will give the Asian inspired dish a miss. I will be back to try their Fish and Chips or their Beef Wellington in the future. Cheers Mate!! Budget per Person: $26 - $50, $51 - $80.